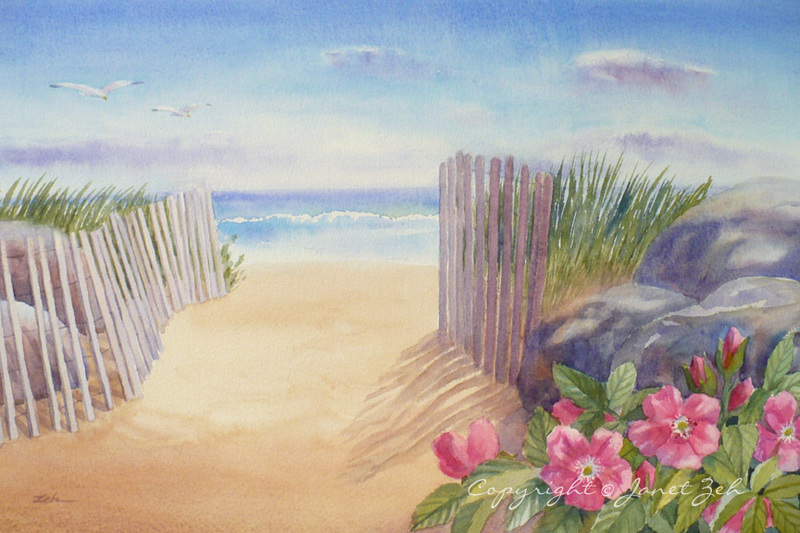 This print of East Beach is from a watercolor painting I did a little while ago. I really (really) like how the painting turned out. It took two tries to get the soft feeling of the sky, ocean and sand (meaning the first try went into the recycle bin) but it was worth it. East Beach is a Rhode Island beach that spans a couple of miles. It is on a protected conservation area - a strip of land divided from the mainland by an inlet. Just the kind of place I like. The main beach may sometimes be crowded, but all it takes is a short walk to find solitude. Quiet but for the crash of waves onto the shore and the cry of sea birds in the air. East Beach original watercolor is sold. You can get a print of it in my Etsy shop here: East Beach fine art print.